Joy Fielding studied at the Northern School of Music in Manchester, gaining the Frederic Moore Piano Prize in her final year. After Post-Graduate study at Birmingham University, she pursued a successful career teaching in secondary schools and colleges throughout Lancashire. She was Head of Music at Notre Dame High School, Blackburn (1981-1985), Head of Music at Clitheroe Royal Grammar School (1985-1991) and Head of Performing Arts at Our Lady & St John High School, Blackburn (1991-2000). She also taught at St Mary’s Sixth Form College, Blackburn and at Westholme School, and was involved in the music outreach project at Blackburn Cathedral, working as a vocal animateur in local Primary Schools. Joy now runs a successful private teaching practice. 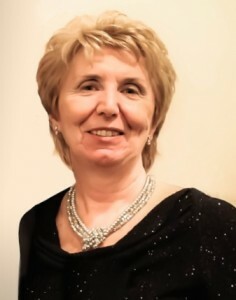 Joy has been the official accompanist of Blackburn Music Society since 1989, making concert appearances with them in Rossini’s Petite Messe Solonelle, the two-piano version of Carl Orff”s Carmina Burana, Karl Jenkins’ The Armed Man, Brahms’ German Requiem and Andrew Carter’s Benedicite. She also enjoys singing with the Altos in many of the Music Society’s concerts, when she is not playing the piano. In 2012 Joy was appointed Chairman of Blackburn Music Society.